Ten years ago, the founder of the MIT's media lab, Nicholas Negroponte, visited Africa and was inspired to resolve the digital gap for the children of the Third World. Consequently, the idea of the "low-priced laptop" evolved. These "low-priced laptops" not only open up the windows of the world to the children of the Third World, but they are also effective tools toward the development of educated thinking. Low-priced laptops could as well be considered an important media for children via exploration and interaction, hence "learn learning ". 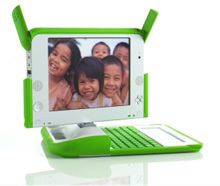 One Laptop per Child (OLPC) is a project supported by the Miami-based One Laptop per Child Association (OLPCA) and the Cambridge-based OLPC Foundation (OLPCF), two U.S. non-profit organizations set up to oversee the creation of affordable educational devices for use in the developing world. The project was originally funded by member organizations such as AMD, Chimei, eBay, Google, Marvell, News Corporation, Nortel Networks, Red Hat, and Quanta Computer. 	In the first years of the project, the Association managed development and logistics, and the Foundation managed fundraising such as the Give One Get One campaign. In 2010 the Association set up a new office in Miami under Rodrigo Halaby, and currently oversees deployment and support for the XO-1.5 laptop and its successors, and country partnerships. The foundation, led by Chairman Nicholas Negroponte, currently oversees development of future software and hardware, including the OLPC XO-3 tablet. One Laptop Per Child believes that innovative design is capable of bringing robust computing to children in the developing world at low power and low cost. This began with the XO laptop, and continues with the second generation handbook and peripherals. This was the original XO laptop, of which over a million were manufactured. Production of the XO-1 stopped in Spring 2010. Configuration：Convertible laptop with pivoting, reversible display; dirt- and moisture-resistant system enclosure; no fan. A refresh of the XO-1 laptop happened in 2009. 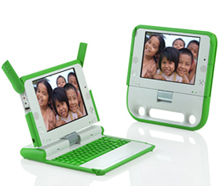 In a continued effort to maintain a low price point, OLPC refreshed the laptop electronics to use the latest component technologies. This refresh (Gen 1.5) is separate from the Gen 2/3 projects, and continues to use the same industrial design and batteries as Gen 1. This provides an overall update of the system within the same ID and external appearance, giving school systems using the XO-1 with a cost effective replacement. CPU運作頻率：400 MHz (1.5 W) to 1GHz (5 W), variable. The clock may be throttled back automatically if necessary to meet thermal constraints; Clock speed changes happen very quickly, as does dropping the processor voltage (0.728V in C3/C4, as compared to 0.798V in C0).